Creative art projects are not just limited to school time. At Little Paintbox we encourage everybody to engage in creative art with children, and our art projects offer a superb way for families to spend time together at home creating that all-important greeting card or gift. Whether it is the family Christmas card, Chinese New Year, Hanukkah or Diwali, whatever the occasion, Little Paintbox Art Projects offer the perfect opportunity for parents, grandparents, siblings and cousins to get involved. If you haven’t already guessed, at Little Paintbox we just love to create! For us, there really is nothing more rewarding than to see your child’s unique and imaginative artwork transformed into useful gifts that family and friends will cherish. At Little Paintbox, we will professionally reproduce your child’s creative artwork onto lovely quality gift items. Little Paintbox Greeting Cards are simple and highly rewarding to make. Your little artists will have hours of fun creating that individual piece of artwork that will feature on the personalised family greeting card. You can even include a special message inside or an image of the little artist or artists on the back of the card – everyone can get involved, even the family dog! You may also wish to produce tea towels and bags from the same artwork, or supply an alternative artwork for these products. Our fabulous, high quality greeting cards are printed on heavy FSC certified card and are 145 x 145 mm in size. Please see online order form for pack sizes and prices. Take a digital image of your children and save the image to CD using your child’s name or email to us (see taking a digital image ) or contact us for a link to our secure dropbox. 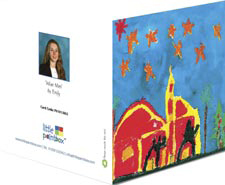 Post the children’s artwork to us at: Little Paintbox, Bunbury Barn, Brand Road, Great Barton, Bury St Edmunds IP31 2PZ. [We recommend you send your artwork and payment by special or recorded delivery, as we are unable to accept responsibility for any items that go missing in the post]. If you would like to pay by debit or credit card, please contact us on 01359 233342 or you may pay via the website. Step 5 – Receive your lovely personalised cards!!! Now the bit the children have been waiting for! We will then process your order and send your cards Whilst we are busy working away in the Little Paintbox workshop, please allow up to 2 weeks for delivery of your items. Costing just £8.50 plus p+p, our strong and spacious canvas bags are made from 100% biodegradable cotton canvas. With long comfortable handles, they not only look and feel fantastic but they are also kind to our planet! This is the fun part where the little artists’ imaginations can run wild. Download a blank bag template here. Remember each bag can be individually personalised for different family members. Step 4 – Receive your lovely personalised canvas bags!!! Now the bit the children have been waiting for! 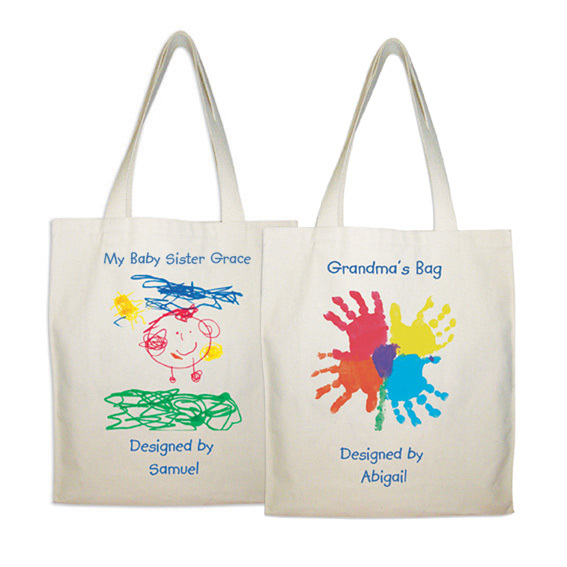 We can guarantee you will be delighted with their personalised canvas bags, which will include your child’s artwork, name and messages or artwork titles. Whilst we are busy working away in the Little Paintbox workshop, please allow up to 2 weeks for delivery of your items. Our 100% close weave cotton teatowels make wonderful practical gifts for parents, grandparents and other family members. Costing just £7.50 plus p+p per towel, they have a lovely luxurious feel and when personalised with your child’s artwork, name and artwork titles, they look just fabulous! Our teatowels are not only a lovely, useful memento for the families of the children involved, but they are a wonderful way that schools, nurseries and charities can effectively fundraise for their organisation. This is the fun part where the little artists’ imaginations can run wild. Download a blank tea towel template here. Remember each tea towel can be individually personalised for different family members. Step 4 – Receive your lovely personalised teatowels!!! Now the bit the children have been waiting for! 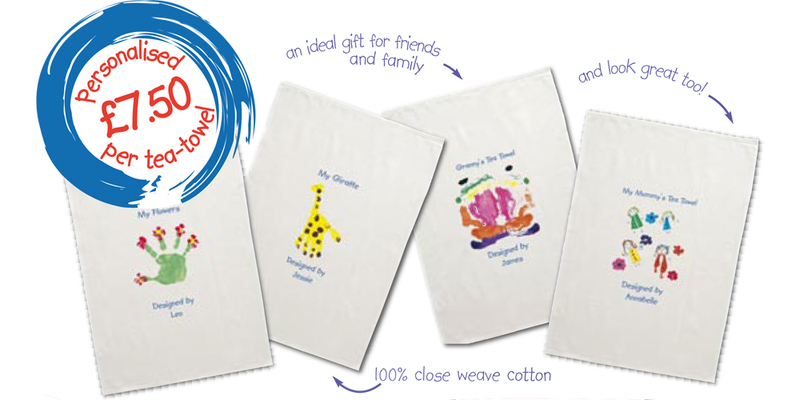 We can guarantee you will be delighted with their personalised teatowels, which will include your child’s artwork, name and messages or artwork titles. Whilst we are busy working away in the Little Paintbox workshop, please allow up to 2 weeks for delivery of your items. Can we have a message printed on the inside of the card? Is there a photograph of the child printed on the back of the card? What colour are the envelopes? What is the size of the bags? How do we take care of the bags? What is the size of the teatowels? What are the teatowels made of? How do we take care of the teatowels?